"I would be the first one to climb up the kampung's observatory tower and tell them where to go," said Mr Chiang, now 67. "I was very adventurous back then." Mr Chiang was the sixth out of 10 children. His parents ran a provision shop, selling milk, rice and pig feed in Kampung Chia Keng - now the site of Serangoon Stadium. While he has fond memories of his early days, they were also a time of great difficulties and even danger. "There was no electricity, no running water in our houses, and we had to use candles, kerosene lamps and take water from a common standpipe outside," he recalls. "We were also living in danger - once there was a fire, there was a possibility that it would wipe out the whole kampung." It was for this reason that the kampung leaders, including Mr Chiang's father, decided to set up a civilian firefighting unit. It was made up of around 30 volunteers who were trained by the Singapore Fire Brigade. "We saved quite a number of people by dousing those fires," said Mr Chiang. Members of the unit doubled as security personnel for kampung residents during festive events, protecting them from pickpockets and gangsters who roamed the area. As the son of a kampung leader, Mr Chiang was involved in many other community activities. He and his siblings helped to operate a free clinic in the kampung twice a week, and they would register patients and set up the space for doctors and nurses to treat kampung residents. When Mr Chiang was about 12, the kampung - which did not offer many recreational activities - set up its own Teochew opera troupe. "We felt that there was a need to bring people together, so we started a Teochew wayang to bring the residents together for entertainment," said Mr Chiang. His family had to "start the ball rolling" and Mr Chiang and his siblings were among its first actors and percussionists. "Some of us even had to dress up as female characters, until we could get enough female cast to join," he recalled. Mr Chiang would play supporting roles, and professional directors would help to run the shows. As a member of St Gabriel's Secondary School's brass band, Mr Chiang joined the troupe's percussion band, playing the cymbals. 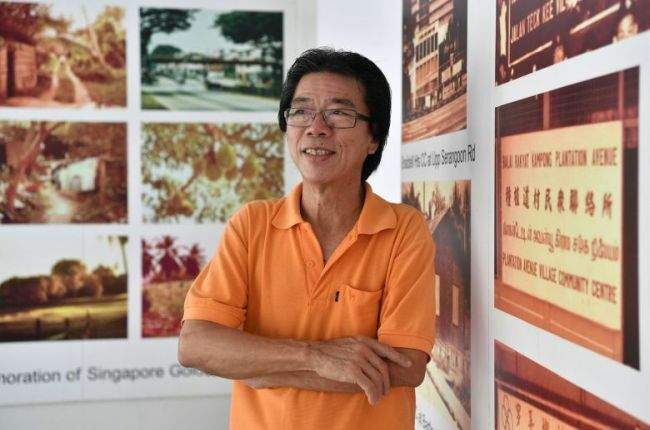 After completing secondary school, Mr Chiang studied at the Nanyang Academy of Fine Arts and in the 1970s, he met his wife while working as a store detective at department store John Little. "I was supposed to detect wrongdoings in the store, but I detected her instead," he laughed. It was also during this period that the authorities resettled kampung residents into Housing Board flats. Mr Chiang, along with his family, moved into a Housing Board flat in Lew Lian Gardens. His brother opened a florist shop there, and Mr Chiang went to work in the shop. However, Mr Chiang remained active in the community at his new residence, joining the Braddell Heights Residents' Committee in 1980. He was a founding member of the Braddell Heights Civil Defence volunteer company - a group of civilians trained to respond during emergencies - and was the group's company commander during the Hotel New World disaster in 1986. The six-storey building collapsed suddenly on March 15, leaving 33 people dead. "I was in the shop doing work when I heard about it on the radio," said Mr Chiang. "It sounded very serious so I quickly called the commander of the national civil defence team to ask if they needed help." Mr Chiang rounded up a team of about 20 volunteers - including hawkers, housewives and students - to go to the site to help clear debris and look for survivors. When experts arrived on the scene, the volunteers took the backseat and helped to distribute food and tended to the family members and helpers at the site. They remained there for about a week, taking turns to care for the people there. "It was very devastating, but also very memorable," he said. Mr Chiang, who has two children and two grandchildren, continues to work as a florist in Lew Lian Gardens, where he still lives today. He is also still active in his role as a vice-chairman of the residents' committee, helping to organise community activities "to gel the people together". He added: "I'm still very active in helping to build a cohesive community."